We're appealing to people who are rummaging around in their attics and lofts for Christmas decorations to keep an eye open for anything they consider “trash”, which could become part of our collection. Our building is not only the home of more than 150 classic cars and motorbikes, but around 30,000 other artefacts from the motoring world, along with many other period household items that you might not expect to see in a motoring museum. 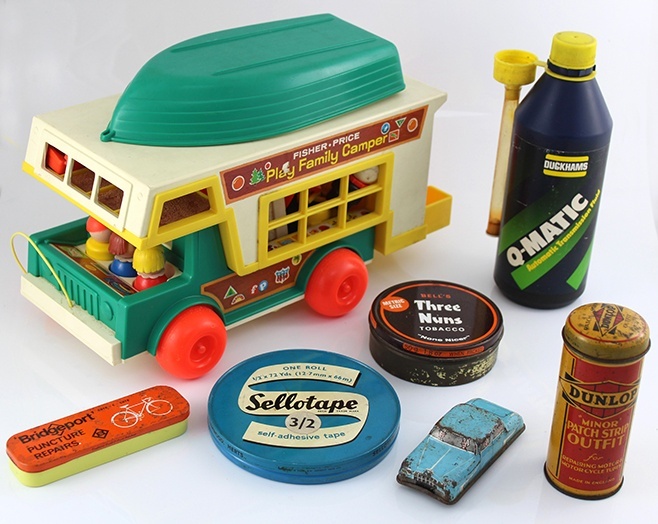 Toy cars, household and tobacco tins and appliances, postcards, advertising signs, posters, clothing, vintage games, maps, even Smurfs and other petroleum collectables are among the items adding extra life, colour and context to the award-winning collection*. *A selection of recent donations to the museum. Thanks to everyone who has donated their attic finds! Operations Manager Chris Lowe, says, “We get hundreds of items donated every year, from car parts to bikes, vintage toys and even boxes of 1980’s washing powder, which are put to good use in our street and shop scenes - allowing us to display our vehicles in the context of the time-periods they’re from. “We’ve had all sorts of items handed to us by people who’ve been having a clear-out. There are so many things that were destined for the rubbish bin that were instead donated to the museum. We then give them a clean-up and add them to relevant displays which attract just as much attention as the cars!